A bird's nest in your backyard? Twinkle, Twinkle, Doggie Star, how I wonder where you are. Move over, Rin Tin Tin. Lassie, go home! Benji who? Do you know who the real canine stars are? Before TV? Before motion pictures? In fact these stars have been around for thousands of years. Here's a hint: go outside on a clear winter's night and look for the brightest star in the sky. Keep in mind that some of the planets can be brighter than the brightest star. For example Jupiter which shines so brightly next to Gemini, is currently more than twice as bright as the brightest star of the night sky, also the planets tend to be much less twinkly than the stars. Give up? It's Sirius, which is also called the Dog Star. Sirius, The Dog Star is significant for astronomers because near it is a much smaller star, known as Sirius B. These two stars orbit their center of mass. First seen in 1862 by the great American telescope maker Alvan G. Clark, Sirius B was the first "white dwarf" star to be discovered. Sirius, the Dog Star, is the brightest star in the constellation Canis Major, "The Big Dog". 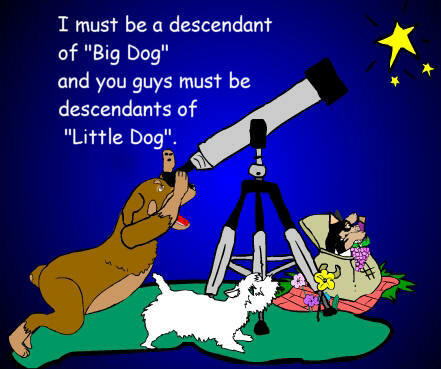 The Big Dog, is one of the companions of the great hunter, Orion. Perhaps second only to the Big Dipper in Ursa Major, the constellation of Orion, is the most recognizable pattern of stars in the sky and it is visible from all inhabited parts of the earth. Don Treworgy, Planetarium Supervisor at Mystic Seaport, The Museum of America and the Sea tells us that the, "familiar pattern of Orion with the three stars of equal brightness in a short straight line, forming his belt, surrounded by four stars in a rectangle can be used as a guide to many other stars. For example, following the line of the three stars in the belt to the left one finds the bright Dog Star Sirius while following the three to the right one finds the reddish star Aldebaran with the somewhat brighter planet Saturn nearby this winter. Out beyond Aldebaran is the tiny dipper shaped cluster of stars known as the Pleiades or Seven Sisters." The sky with its constellations is perhaps humanity's oldest picture book. For thousands of years, people have looked into a clear night sky and have seen the same stars you and I can see today. The stories of the star pattern that we know as Orion are many. It is one of the most universal mythological characters and has many different forms. Orion, the hunter, stands by the river Eridanus and is accompanied by his faithful dogs, Canis Major (Big Dog) and Canis Minor (Little Dog). Together they hunt various celestial animals, including Lepus, the rabbit, and Taurus, the bull. In the past, people had an excellent knowledge of the night sky. They were able to tell when to plant and when to harvest, and later they navigated the seas with the stars. These "little diamonds in the sky" forming constellations have also inspired storytellers and the positions of the sun, moon and planets within the band of twelve constellations of the zodiac have been used by some in their practice of astrology. Go out on a clear moonless night far away from the city lights and enjoy the beauty and wonder of the night sky! The Mystic Seaport offers a planetarium program at 2:00 PM, seven days a week. Those who attend their planetarium programs can learn more about finding the constellations, and how one can determine the directions by the stars. They also offer courses in navigation and star identification. For more information call the Planetarium at (860) 572-5302, extension 5151. Programs, times and upcoming events ... (517) 355-4672.
why the water went away!